Did you know that dental implants are frequently the best treatment option for replacing missing teeth? Rather than resting on the gum line like removable dentures, or using adjacent teeth as anchors like fixed bridges, dental implants are long-term replacements that your oral and maxillofacial surgeon surgically places in the jawbone. Statistics show that 69% of adults ages 35 to 44 have lost at least one permanent tooth to an accident, gum disease, a failed root canal or tooth decay. Furthermore, by age 74, 26% of adults have lost all of their permanent teeth. Twenty years ago, these patients would have had no alternative but to employ a fixed bridge or removable denture to restore their ability to eat, speak clearly and smile. Fixed bridges and removable dentures, however, are not the perfect solution and often bring with them a number of other problems. Removable dentures may slip or cause embarrassing clicking sounds while eating or speaking. Of even greater concern, fixed bridges often affect adjacent healthy teeth, and removable dentures may lead to bone loss in the area where the tooth or teeth are missing. Recurrent decay, periodontal (gum) disease and other factors often doom fixed bridgework to early failure. For these reasons, fixed bridges and removable dentures usually need to be replaced every seven to 15 years. Today there is another option for patients who are missing permanent teeth. Rather than resting on the gum line like removable dentures, or using adjacent teeth as anchors like fixed bridges, dental implants are long-term replacements that your oral and maxillofacial surgeon surgically places in the jawbone. Composed of titanium metal that "fuses" with the jawbone through a process called "osseointegration," dental implants never slip or make embarrassing noises that advertise the fact that you have "false teeth," and never decay like teeth anchoring fixed bridges. Because dental implants fuse with the jawbone, bone loss is generally not a problem. After more than 20 years of service, the vast majority of dental implants first placed by oral and maxillofacial surgeons in the United States continue to still function at peak performance. More importantly, the recipients of those early dental implants are still satisfied they made the right choice. If properly cared for, dental implants can last a lifetime. A dental implant designed to replace a single tooth is composed of three parts: the titanium implant that fuses with the jawbone; the abutment, which fits over the portion of the implant that protrudes from the gum line; and the crown, which is created by a prosthodontist or restorative dentist and fitted onto the abutment for a natural appearance. Many people who are missing a single tooth opt for a fixed bridge; but a bridge may require the cutting down of healthy, adjacent teeth that may or may not need to be restored in the future. Then there is the additional cost of possibly having to replace the bridge once, twice or more over the course of a lifetime. Similarly, a removable partial denture may contribute to the loss of adjacent teeth. Studies show that within five to seven years there is a failure rate of up to 30% in teeth located next to a fixed bridge or removable partial denture. Fixed bridges may require the shaping or cutting down of adjacent healthy teeth. Bone is maintained by the presence of natural teeth or implants (a). Bone loss occurs with the loss of teeth (b). Further, conventional dentures may contribute to the loss of bone in the area where teeth are missing. As illustration (a) indicates, the presence of natural teeth preserves the jawbone. 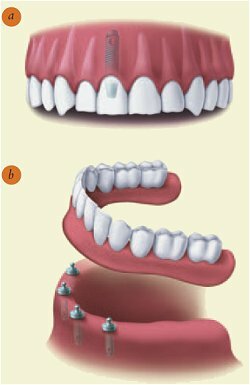 When a tooth is missing, as in illustration (b), the bone may erode and weaken until it may be necessary for your oral and maxillofacial surgeon to graft bone to the area to strengthen it for placement of a dental implant. 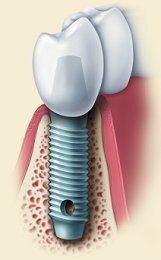 When a missing tooth is replaced by a dental implant, the fusion, or osseointegration, of the implant and bone provides stability, just as the natural tooth did. If you are missing several teeth in the same area of your mouth, you may still enjoy the confidence and lifestyle benefits that come with dental implants. Your oral and maxillofacial surgeon will place two or more dental implants, depending on the number of teeth that are missing. Your replacement teeth will be attached to the implants to allow excellent function and prevent bone loss. The implants will serve as a stable support that tightly locks into your replacement teeth and dentures to prevent slipping and bone loss. With an overall success rate of about 95% and almost 50 years of clinical research to back them up, dental implants are frequently the best treatment option for replacing missing teeth. Implants can be used to replace one missing tooth so that the replacement looks and feels natural (a). Also, two or more implants can serve as a stable support for the replacement of many teeth (b). Many patients who have selected dental implants describe a quality of life that is much more comfortable and secure than the lifestyle endured by those with fixed bridges or removable dentures. Dentures often make a person feel and look older than they are, cause embarrassment in social situations when they slip and click, and restrict the everyday pleasure of eating comfortably. When they count the benefits they enjoy as a result of their dental implants, patients say their implants eliminate the day-to-day frustrations and discomfort of ill-fitting dentures. They allow people to enjoy a healthy and varied diet without the restrictions many denture wearers face. With a sense of renewed self-confidence, many people rediscover the excitement of an active lifestyle shared with family and friends and the chance to speak clearly and comfortably with co-workers. For all these reasons, people with dental implants often say they feel better... they look better... they live better. Dental implants combine the best of modern science and technology, including a team approach spanning several disciplines. A successful implant requires that all parties involved - the patient; the restorative dentist, who makes the crown for the implant; and the oral and maxillofacial surgeon, who surgically places the implant, follow a careful plan of treatment. All members of the implant team stay in close contact with each other to make sure everyone clearly understands what needs to be done to meet the patient's expectations. The team is organized as soon as the decision for placing a dental implant is reached. Following an evaluation that includes a comprehensive examination, x-rays and a consultation with the patient and members of the implant team, the oral and maxillofacial surgeon surgically places the posts, or implants, in the patient's jaw. When the implants have stabilized in the jaw, the restorative dentist prepares an impression of the upper and lower jaws. This impression is used to make the model from which the dentures or crowns are created. The teamwork continues long after the implant and crown have been placed. Follow-up examinations with the oral and maxillofacial surgeon and restorative dentist are critical, and progress is carefully charted. Both the oral and maxillofacial surgeon and the restorative dentist continue to work together to provide the highest level of aftercare. Existing Medical Conditions. If you can have routine dental treatment, you can generally have an implant placed. While precautions are advisable for certain conditions, patients with such chronic diseases as high blood pressure and diabetes are usually successful candidates for dental implant treatment. Gum Disease or Problem Teeth. Almost all implants placed in patients who have lost their teeth to periodontal disease or decay have been successful. Currently Wearing Partials or Dentures. Implants can replace removable bridges or dentures, or they can be used to stabilize and secure the denture, making it much more comfortable. Smokers. Although smoking lowers the success rate of implants, it doesn't eliminate the possibility of getting them. Bone Loss. Bone loss is not uncommon for people who have lost teeth or had periodontal disease. Oral and maxillofacial surgeons are trained and experienced in grafting bone to safely and permanently secure the implant. Implant tooth replacement in children is usually deferred until their jaw growth is complete. There are, however, some instances when a dental implant may be appropriate, such as when it is part of the child's orthodontic treatment plan. Your family dentist or orthodontist can guide you in this instance. Copyright © 2011 Dr. William G. Bast | All rights reserved.